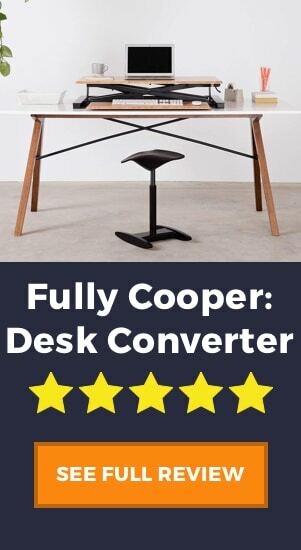 The Cooper standing desk converter by Fully is a marvel of design, quality, ergonomics, and build. It has been mentioned time and time again on Painless Movement, firstly in our article of best standing desks for tall people, and then again in our more recent article comparing electric and manual standing desks. It’s no wonder that the Cooper gets these honorable mentions when you take a look at the raving reviews it has constantly received from its users. Not only is it a well-received product, but it also comes with a very affordable price tag. We’d like to give you our own breakdown of this incredible product to see why so many users recommend it, and why so many people have happily incorporated this desk converter into their daily working lives. 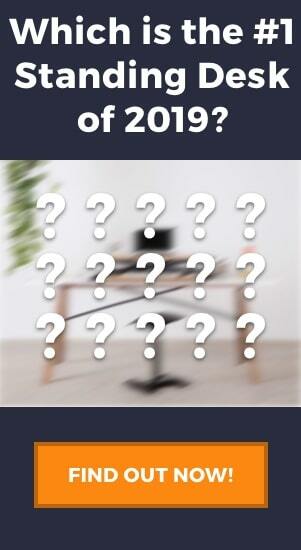 DO NOT MISS: Take a look at what we believe are the best standing desk converters in 2019. This will always be, for us, a huge benefit of the Cooper desk converter. When thinking of buying a standing desk, you must always take into account the range of height adjustment, so you can work comfortably in both seated and standing positions. In terms of desk converters, the Cooper is one of the tallest on the market. The average desk converter may reach a maximum height between 18″ – 20″, but the Cooper goes a step further to 22″. 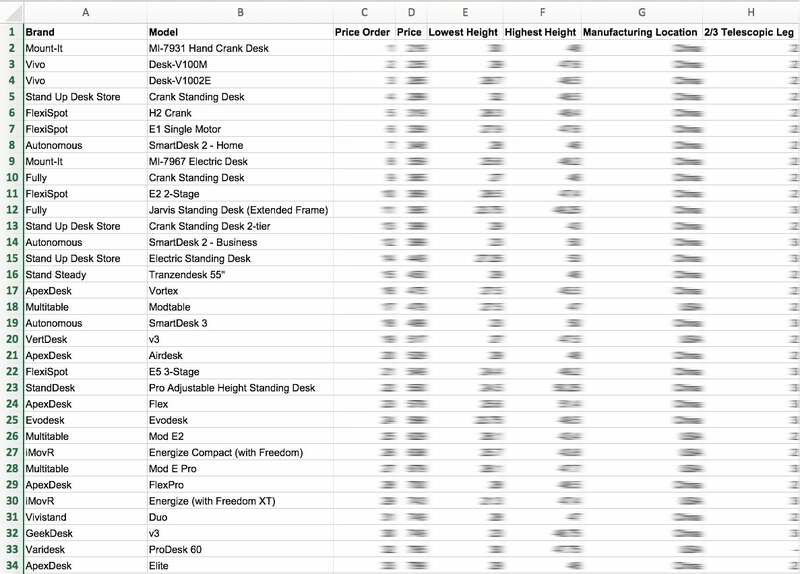 Looking at our height chart for ergonomic standing desk heights, we can see that 22″ plus a standard desk of 29″ is sure to be a good fit for most users. Fully users top quality materials to build their products, and the proof is in the pudding. This product comes with two options: either a bamboo finish or black MDF. We love the style of the bamboo, plus it is 5.5 lbs lighter making the desk converter just that little bit more maneuvrable. The reason Fully choose these materials is for their eco-friendly nature. Bamboo plants mature in 5 years making this type of wood very sustainable. The MDF is also compliant with strict European laws that make it environmentally friendly, as is the powdercoat finish that releases no harmful chemicals into the atmosphere. Where the cooper standing desk converter separates itself from other products is the infinite height range. This doesn’t mean that there is no upper height limit, but between the collapsed and extended position, it can be stopped anywhere. Products such as Varidesk standing desk converters use a system with height levels, meaning that the desk can only be adjusted to these specific heights. 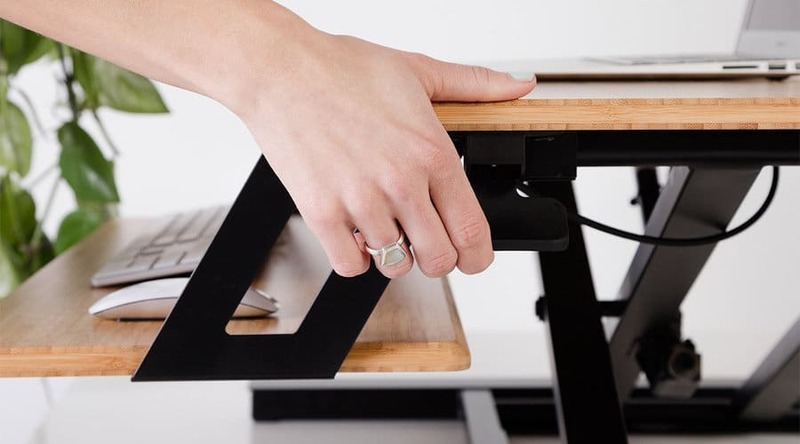 Another feature we love is the single-handed paddle to adjust the desk. Most converters have two squeeze paddles or levers for height adjustment, but the Cooper simplifies that so you can multitask and still raise your desk converter. This lever can also be controlled by its tension adjustment feature. With an Allen key, you can tighten or loosen the resistance of the lifting mechanism. This is great for people who need extra stability for their heavy monitors, or for those who need to make it a little easier to move back down. HANDY TIP: To boost the ergonomic benefit of a standing desk, we recommend using it with an adjustable monitor arm. This product has a nice, large surface area, capable of holding two monitors, a laptop, keyboard, and mouse. We especially like the fact that the keyboard tray and the monitor surface are separated into two tiers, allowing for a more ergonomic hand and wrist position. Part of the keyboard tray is located under the top tier, but with 6″ of space between the two it won’t be an issue to fit your hands. The total footprint is large which makes this desk converter very stable. This can be seen as a negative by some users however that are looking for a smaller product that doesn’t occupy their whole desk. This last feature is one that is fairly common in most modern standing desk converters, but still something that we’d like to point out. If you’re no handyman and the idea of an IKEA product scares you, then Cooper has you covered. It comes fully assembled straight out of the box, and it is 100% manual so you don’t need to plug it in or anything. Just find a desk, place it on top, and you’re set to go! Although the keyboard tray adds additional ergonomic benefits that a standard one-tier desk would, there are issues with the fact that the tray itself is fixed. The user is not able to adjust the height independently of the monitor surface, nor can you change the angle at which you type. Fully actually recommends on their website to purchase an adjustable monitor arm to truly experience the ergonomic benefits of this product. The tension adjustment is one of the areas in which we have seen some customer complaints. This is an issue with the infinite height levels, that although more ergonomic, don’t have the ability to “lock” in place. It is possible that the tension is not tight enough and the desk may not be as stable as you need, or conversely that if the tension is too tight it will be more difficult to move. It seems that finding this exact point of tension can be tricky and is very much user-dependent. Your tension setting will have to depend on how much you load your desk converter, and how strong you are. The warranty for the Cooper is 2 years. Comparatively, this is quite a short time, given that other standing desks offer up to 10 years warranty. In saying this, Fully has a 30 day period during which it accepts returns. If you are not satisfied within the first 30 days of use and send the product back as new, then you will receive your money back. The Cooper is hands down one of the best manual standing desk converters that we have researched. It is affordable, beautifully designed, structurally sound, and all-in-all a real crowd pleaser! 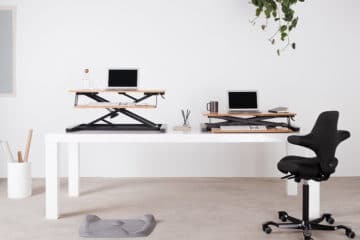 Most of all we love that they have created a stable and ergonomic standing desk converter, that competes in adjustable range with some height adjustable desks. All in all, we give the Cooper a solid 4.75 out of 5, and we think you’ll be very happy when one of these arrives at your front door!